An interesting week for the euro vs dollar which started the week in bullish mood, surging to USD1.34 on Monday and breaking higher again on Tuesday, only to close with a warning signal of shooting star candle which has been duly validated in the second part of the trading week. The high of Tuesday’s price action at USD1.3498 failed to trouble the 40 day moving average which continues to point lower and add further pressure to downwards slide. Wednesday’s price action was pivotal with a break and hold below both the 9 and 14 day moving averages with today’s price action adding yet a further layer of bearish sentiment as this week’s close is now looking set to hold below these averages. Today’s chart has seen the euro vs dollar attempt to rally, boosted initially by better than expected German Ifo data, only for the pair to fall back on the news of a further downgrade for Ireland. 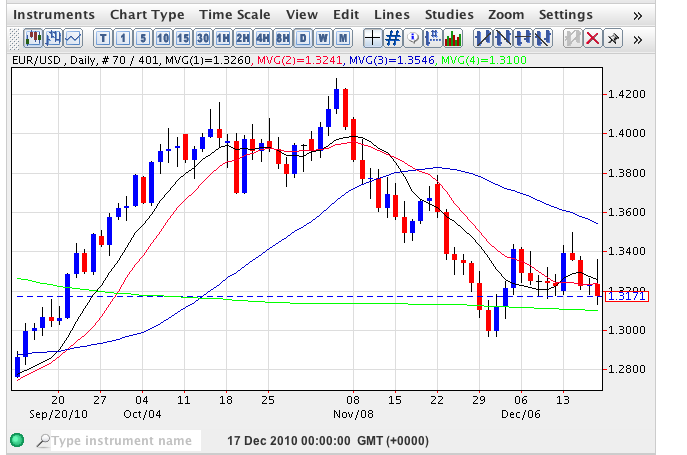 The immediate technical picture on the daily chart is now dominated by the 200 day average which currently sits at USD1.31 and the significance of this cannot be underestimated with any break and hold below signalling a deeper move to re-test the USD1.30 region and possibly on towards the initial price congestion at USD1.2919 in due course. 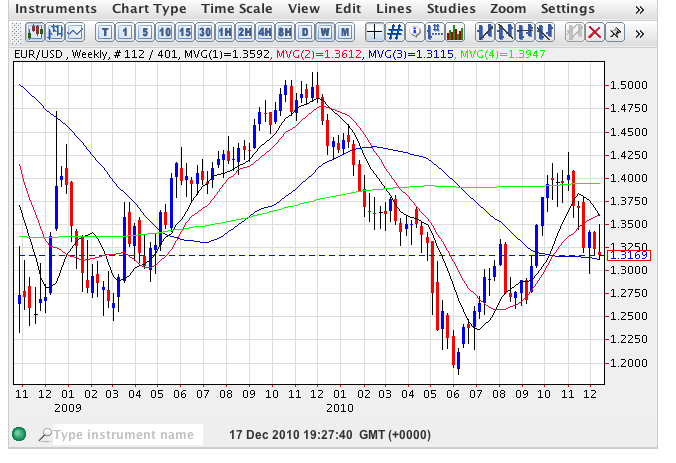 The weekly chart for the euro vs dollar would also confirm this view and here again we have a key technical level at USD1.3115 which, in this case, is the 40 week average, which in fact came to the rescue in today’s trading session. However, with the 9 week average now crossing the 14 week giving us a bear cross signal, any breach of the 40 week average will a signal a move lower for the eurodollar and indeed with the deep shadow to the upper body of this week’s candle now clearly evident, this seems increasingly likely. Please like this post if you found it useful – thanks.